I’ve discovered a strange pattern recently – a restlessness in my spirit that seems to hit me every year around this time, and keeps me from sleep. Some unseen goblin has been sitting on my chest like the one in Fuseli’s painting The Nightmare, although instead of swooning dead away with fright, I am just a tight little ball of nerves, anxiously tossing and turning beneath my thin summer blanket. I normally don’t suffer from insomnia, or don’t notice if I do usually – being habitually such a night owl and giving myself the luxury of staying up most nights as long as I like, writing, reading, puttering or watching movies. When I finally get tired, I go to bed – even if that happens to be 3 or 4am. It used to be even later, when I was really hammering away on something. The wee hours are sacred time, when the rest of the world is fast asleep, and no one is expecting anything of you. But there are times when I’d like to just fall asleep at a normal, reasonable hour, and wake up when the day still feels new – and it’s on those nights lately that my mind races through every regret, every letter and email unanswered (lord, so many! ), each and every instance where I meant to be a better person, a better friend, but then disappointed myself, and others. What is it that keeps me up? I can’t quite put my finger on it, because overall right now, I feel very content and for the most part, quite happy. Is it related to my mother’s August death, or Hurricane Katrina, or the demise of my last long-term relationship – all of which gut punched me in August, during the dog days of Southern summer. It must be some elusive muscle memory, an old story only my body remembers, my nervous system engaging back into instinctive flight or fight. It’s something I can’t quite put my finger on, but realizing that it hits me every year is almost a comfort – because maybe next time round, I could actually prepare for it. Stock up on Epsom salt and kava kava, or book more massages. I have to do something, because the cortisol that floods my body makes my limbs contort with stored up tension and ache deep in my joints. Maybe it’s all this rain we’ve been having, the barometric pressure shifts, or the dampness and mold in the air. The no-name storm that squatted malevolently over Louisiana what felt like an eternity finally moved west, and has been doggedly soaking our cracked and crispy Texas soil. We’ve needed it, so I can’t complain, and I am delighted to hear the little tree frogs, golden-eyed peepers that talk to each other quietly all night long. Big chubby-bellied toads hop around the yard, splaying their fat fingers over hundreds of tiny grey mushrooms with moist, tattered caps that will vanish as mysteriously as they appeared, once the rain blows over. I buried these sweet babies in the roots of my favorite rose bush, so that they might bloom again – in a different form. Every night, their brothers and sisters serenade me in a chorus of gentle peeps, teaching me their language in my sleep. These days and days of rain were a boon to us, and a bane back east. I’ve written about this before – the mixed up feelings I have when August storms curse the wetlands and coast but bless our parched earth. Hurricane season means we might finally get a blast of rain, but a weakened system, not capable usually of wreaking quite so much havoc. I get hypervigilant around this time of year, keeping an eye on the weather, on the tropical depressions and the threat of whirling winds. Even without a hurricanes in the Gulf (yet, and heavens forfend) this year, Louisiana has been nearly drowned by these persistent rains. They’re saying this is the worst disaster since Hurricane Sandy, and yet I can’t help it – I perceive something a little different in people’s responses and reactions to this kind of shitstorm happening in the deep south. There’s a shrug of the shoulder, a kind of blind eye, a certain diffidence in the body language that I wish I could stop interpreting as, “Well, they do live down there in the swamps anyway…Don’t they know any better?” Maybe I’m wrong about that. I know a lot of people care. But it’s weird to see what people care about, or what their social media feeds tell me they care about, anyway. I get it, it’s not a totally valid source of information to weigh judgment against – and it’s less about judging and more about just inputting the information I come across, and determining what exactly to do with it. I mean. We’re talking about 60,000 homes and businesses. More than two feet of rainfall in three days. One hundred thousand people evacuated. It’s a helluva thing. And it’s here, at home. We can’t just shake our heads when whole towns are underwater. Of course, we’re going to see more and more of this. Much more. It’s easy to become inured to it, to all of it – all the terror, disaster, suffering going down in the world… But if you’ve lived it once before, you can’t just ignore. I can feel the fear and sadness rising up through the roots, blowing through the pines. I want to tell them I’m sorry. So sorry about everything that was lost, everyone that drowned. I hope they find a way to make it right again. It takes some time. And some things never come back together. It’s never the same, after. I know that now. The recent deluge we experienced for days on end down here in Texas was much needed, but it made me melancholy. 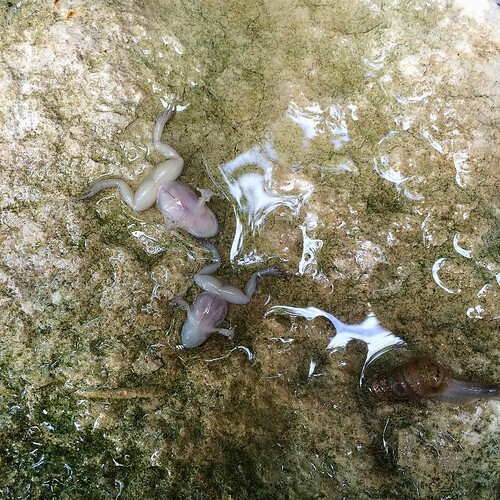 I have been feeling extra sensitive, soft underbelly exposed – as vulnerable as these poor sweet tree-frogs I found drowned in the rainwater filled cat food bowls early one morning after a night of storming. It seems strange that an amphibian could drown, but apparently, they can. I mourned these two meeting their fate in this way. 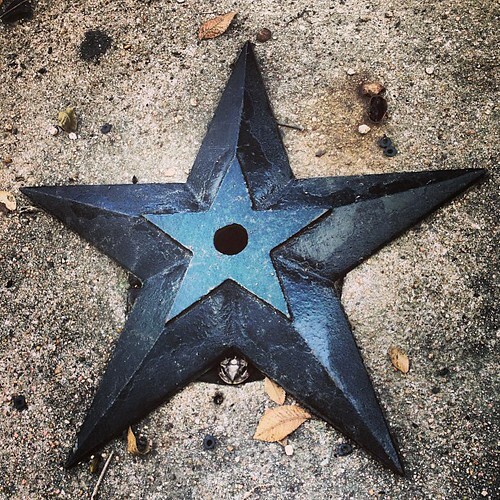 It’s rare that I get to see these guys – usually they’re hiding out in dark nooks and crannies around my porches. I love eavesdropping on their conversations (I’m listening to them as I write this). I wonder what they’re saying to each other. 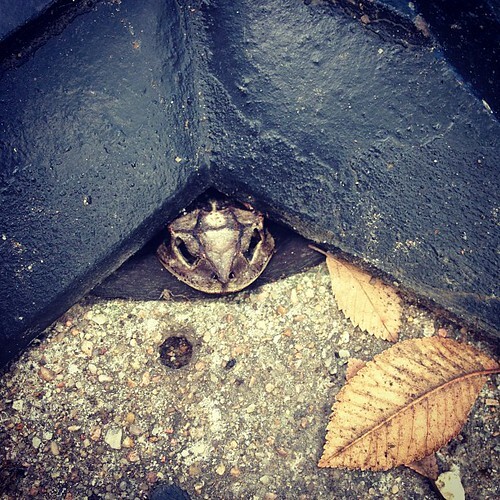 Frog totem brings cleansing. I’ve always known I carry this medicine, even though I resisted it when I was younger. I remember feeling like the ugly Frog Princess around all my swanlike girlfriends. Pale with big eyes and easily hurt feelings, so thin skinned and affected by toxic energy in ways I didn’t even understand at the time. I would hunker down on my little lily pad of self-pity, not realizing what gifts I had. Taking it all so much for granted – the way young folks do. I feel so grateful for my years on this year, and what some maturity has brought me, and taught me. 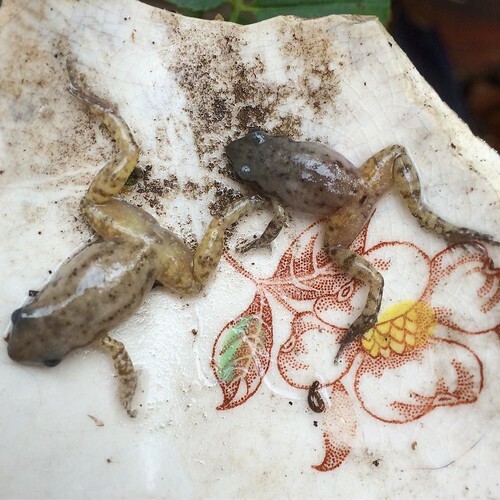 For instance – how lucky I am to have Frog medicine! They leap between worlds, and can cleanse negativity and bad spirits. 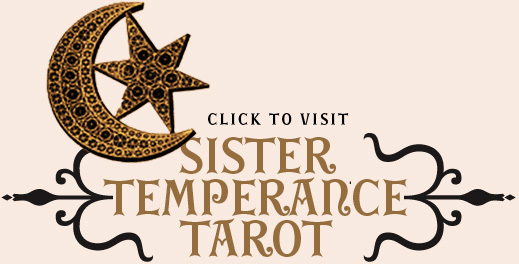 I keep a little rose quartz frog with me when I read tarot for people, and I know she helps me in my work. Also: I don’t know why I ever thought frogs were ugly. I don’t know how I ever thought I was. We’re not – not at all. “Frog sings the songs that bring the rain and make the road dirt more bearable. From Medicine Cards, by Jamie Sams, and David Carson. Poor mister toad. I was grateful to be able to save the one I found, if not his brother. Now I always watch out for them. A glorious golden thunderstormy afternoon. Everything sparkles and flashes bronze in the setting sun. 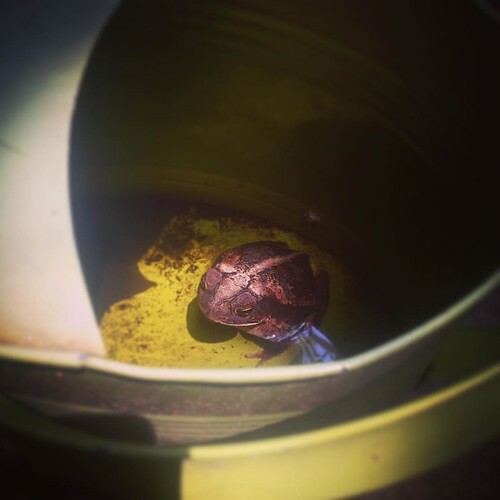 I found this big dude chillin’ in my watering can recently and thought maybe he was stuck. So I put him in the garden. Today, he’s back in the can. Sorry, toad friend! The watering can is clearly Barton Springs for toads. 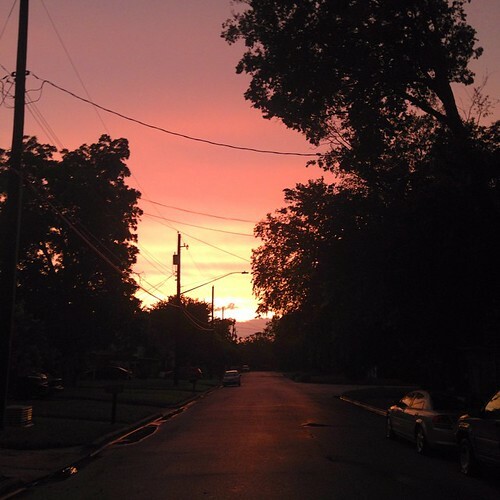 Evening walk after the storm. All is quiet, painted dripping rose gold. The hush of water soaking the earth, and fireflies winking bright into the night air. I know how lucky I am. I count my blessings. The roof over my head. The high ground I live on. All my books out of boxes and up on shelves for the first time since Katrina. I’m home, and I’m safe, and it’s beautiful. I’ve been working really, really hard to make it that way. To convince my nervous system that it’s as okay as the rest of me is. It’s still hard, eleven years later. My lucky number. I’m doing the work. It helps. But the storms keep on coming, and it hurts me to see the water rising, see people losing everything. I remember. This is from my old friend Desier Galjour in New Orleans – she’s been boots on the ground doing flood relief down there, and I think what she says here is so, so important. If you can’t be there physically in person to help, (and aren’t able to make it to my Fais-Do-Do Fundraiser on Wednesday!) but still want to offer assistance, please consider donating to these reputable organizations that are doing great work. Please do not donate to Red Cross. Thank you. 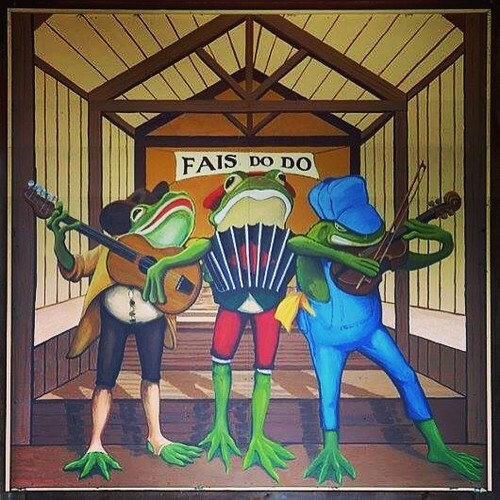 This mural is from Rayne, Louisiana – Frog Capital of the World! It looks like they’ve taken a fair amount of flooding in all this. I’ve always wanted to go there, for their Frog Festival (though I would never eat frog legs – the horror!) I just wanna hear some good Cajun music and maybe watch some frog races! 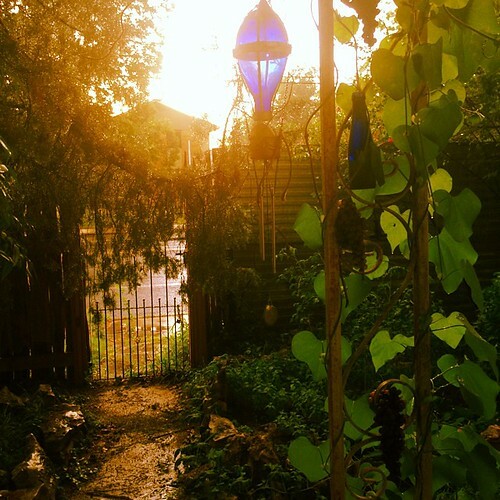 We’re putting together a little backyard Fais-do-do Fundraiser to get some money and donations together for the folks affected by the terrible floods in Louisiana. It will take place on Monday evening, August 29th, which is also the 11th anniversary of Hurricane Katrina. After losing my home in the storm, I want to honor the day, the dead, and all those who were affected by rallying support for people who need it badly right now. I’m inspired by all the folks stepping up to serve in the “Cajun Navy” – helping out their neighbors because that’s just what you do! So we’re gonna get some money and cleaning supplies and other needed goods and send it to Louisiana! Let’s sing and dance and be together. It felt so good to gather last year, for the full moon. Very healing. We’re keeping a close eye on the weather – we may have to postpone/reschedule if it thunderstorms… I can’t fit that many people in my living room! So please do some weather magic for us, eh? The irony of a flood relief benefit getting rained out is just too much! There’s a 60% chance right now. If we postpone it, we’re thinking this Wednesday, August 31st. Oh, weather gods! Please cooperate with us. With everybody. 1. In what sense is creative writing a form of cultural and institutional revenge? 2. Take pristine care of your blood. 3. Every day, orient to joy and pleasure. How? 4. Scrub your arms up to the elbow with salt then rinse them in cold water. 5. Change your clothes and shower when you get home, even if you are tired. 6. Let nettle and oatstraw steep in a mason jar and drink the resulting infusion. 7. Chelate long-held, chronic trauma, anxiety and fear. It’s time. * I love you. *How? 8. Remove yourself from situations that cause you distress. How? 9. Spend time with your beloveds. Who are your beloveds? 10. Drink hot water in the morning. 12. Write until you reach the edge of something, whether it’s the world, the community you live in, or your skin. I’m listening to Bessie Smith’s big full-bellied blues as I write this, and praying for Louisiana – for the living and the lost, the waters and the earth. Even though Bessie’s singing about missing Mississippi, I think I know that feeling. It’s always a pleasure to drop in and read something inspiring and thoughtful that you have shared, and to see your photos and choices of art.